Aurora City Hall is located at 130 South Chillicothe Road, Aurora, OH 44202; phone: 330-562-6131. Photo: Emery Root House, ca. 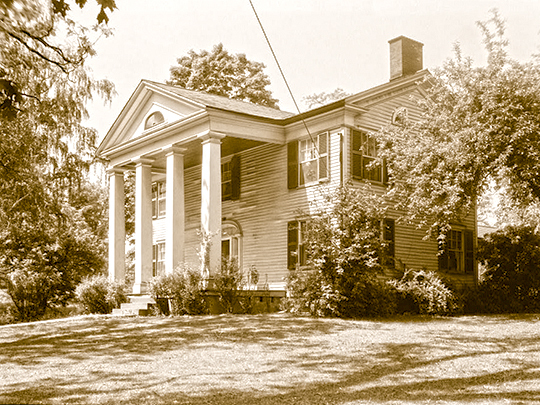 1810, Chillicothe Road, Aurora, OH. Listed on the National Register of Historic Places in 1972. Photographed by Carl Waite, 1936, Historic American Buildings Survey [HABS OH-281], memory.loc.gov, accessed April, 2014. In the Spring of 1797 when the surveying party fixed the limits of Portage County, David, Ebenezer and Fidelio King purchased and drew in a land lottery, Town 5 in the 9th range. This was to become the Aurora we know today. Ebenezer Sheldon, Jr., Gideon Granger and John Leavett had sub-interests. Of the men who made up Aurora's early settlers, Orrin Harmon, recorded in his own handwriting in 1866 this early history: "At the first division of land, Town 5 in the 8th Range (Mantua) and Town 5 in the 9th Range (Aurora) were drawn by an association of individuals known as the Big Beaver Land Company. The members of this company were residents of Suffield, Connecticut and vicinity. They were mostly farmers by occupation and resided on their farms, though they were, like many New England men of that time, much given to speculation." Principal stockholders were Luther Loomis, Martin Sheldon and Fidelio King, active business men in their home state of Connecticut. James B. Holm, Editor and Lucille Dudley, Assistant, Portage County Historical Society, Portage Heritage, Susqui-Centennial Edition, 1957.